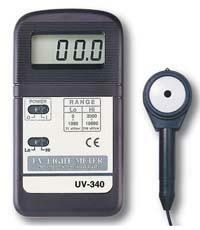 Our new ultraviolet light meter has an overall wavelength spectrum range of 290 to 390 nm. The unit is ideal for collecting both UVA and UVB irradiance measurements. The meter uses a remote UV sensor the permits measurements from any position. Measurments of UV light is user selectable in either Hi or Low ranges. Accuracy is ®± 4% of full scale for all ranges. Sampling time is approx. 0.4 sec. The 3 digit, ½"H LCD indicates when your reading is over the selected range. Features include, low-battery indicator and auto off. The meter operates on one 9V battery (included) and comes with remote sensor, hard case and instructions. The meter measures 2-3/4"W x 5-1/4"H x 1"D.